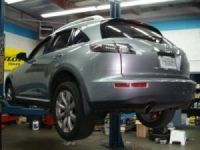 We perform scheduled maintenance mainly for all Japanese makes and models. However, we do service not only for Japanese cars. We DO have experience and actually do service for European and American vehicles also. We provide ALL services except paint and body work. and our flat rate charges for major services are substantially below dealership charges. Bring your vehicle to AutoHQ to ensure the best and most comprehensive care for your car, truck, SUV or van. We guarantee the highest quality of our work!